Researchers at the National Renewable Energy Laboratory (NREL) report the creation of an efficient tandem perovskite solar cell, using a new chemical formula which also improved the structural and optoelectronic properties of the solar cell. Most of the research efforts in the field of PSCs have focused on lead-based perovskites, which have a wide bandgap. 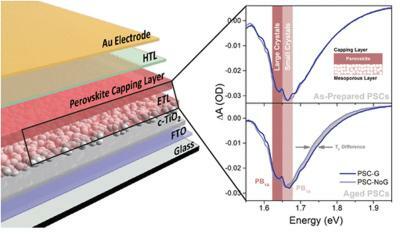 High efficiency, low bandgap perovskites would enable the fabrication of very high efficiency all-perovskite tandem solar cells where each layer absorbs only a part of the solar spectrum and is optimally configured to convert this light into electrical energy. However, low bandgap perovskites have long suffered from large energy losses and instability limiting their use in tandems. Researchers from the Research Center for New Generation Photovoltaics (RCNPV) in Taiwan have developed solid-state perovskite solar cells which can convert indoor light to power IoT sensors. Research Center for New Generation Photovoltaics (RCNPV) director, Wu Chun-guey, said: "Power conversion for a perovskite solar cell with area of 0.0739 square cm is 23.7%, and the efficiency decreases to 20.9% for cell area of one square cm, 17.25% for 17.277 square cm, and 11.7% for 703 square cm".